.......53 Buddhas and Me .................My Life Adventures.....: "Music Music Music"
Now I really love listening to all kinds of music, but, I have listened so much music since Friday night I really don't want to hear any sort of song today. My eardrums need a rest. Friday nights Cadd and Morris concert was fabulous. Its so nice to spend a night singing along to songs you know every word to, such as "Little Ray Of Sunshine" and "Real Thing". If only my maths at school had been in song form I may have remembered something. I must say Russell Morris looks so so much better now that he doesn't try and hide his bald head under a hat, he is now bordering on "HOT". Also he really is sounding great - he really does have a great powerful voice. 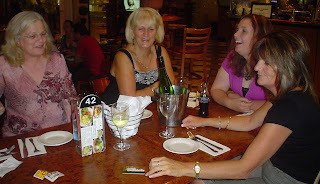 The five of us girls had a really good night out. Then yesterday - how good were the "Sound Relief" concerts. I know some young ones out there may not agree, but some of the bands had a lot to be desired, but it was still good to listen to all sorts of music. My favorites would have to have been of course the "ONE" song by John Farnham, Coldplay were great and Midnight Oil were just amazing. I have said it before and I will say it again - we really do live in the best country in the world and we Aussies are really amazing people. We can "ALL" be proud to be Australian.